United States’ onshore oil production could increase about 75 percent by 2022, and North Dakota would be a primary contributor, according to a recent report. “[The U.S.] is going to continue to drill quite aggressively,” said Chris Micsak, oil analyst with BENTEK Energy, a Colorado-based energy market analytics company that provides data-driven research and market understanding. The U.S. is the world’s third largest oil producer, behind the leader, Saudi Arabia, and then Russia. China and then Iran follow the U.S., per the U.S. Energy Information Administration, which collects, analyzes and disseminates independent energy information. In 2011, its third consecutive year of oil production growth, the States generated 5.7 million barrels per day of crude oil, onshore and offshore (or 2.1 billion barrels total), EIA data show. Total oil production, crude and other, was 10.1 million barrels per day (or 3.7 billion total). Total domestic oil consumption that year, 18.8 million barrels per day, resulted in a net shortage of 8.7 million barrels per day (or 3.2 billion barrels total). America is the world’s greatest oil consumer. This compares to 87 million barrels per day of oil (or 32 billion barrels total) produced in all other countries together. Last year, the U.S. produced about 11.5 percent of the world’s oil. In its “Crude Awakening: Shale Boom Hits Oil” report, which provides U.S. oil production analyses and predictions, BENTEK Energy forecasts American oil production (onshore only), primarily light and intermediate crudes, to hit 4.9 million barrels per day, a 74 percent jump, in ten years’ time. In 2016, it’s expected to reach 9.8 million barrels per day. Both predictions assume oil prices and current rig count and activity would remain constant, Micsak said. “Crude Awakening” notes, therefore, if the rig count increases, then BENTEK’s base case forecast likely is too low and vice versa. The report also indicated U.S. oil production is growing faster than BENTEK projected in previous editions. The reasons for the acceleration are: the decoupling of oil and gas prices and improved technologies, Micsak said. Natural gas prices have dropped since mid-2008 and hit a 10-year low this year. During the same time, oil prices remained well supported due to various macroeconomic factors and the plunge of natural gas prices. Higher oil prices, together with new technologies in horizontal drilling and hydraulic fracturing that made the extraction of tight and shale oils possible, led to exploration of resources that previously weren’t economically viable. Over the next decade, BENTEK also expects U.S. demand for oil and petroleum products to remain relatively static, Micsak added, thus gradually closing the gap between supply and demand. As a result, in just four years, U.S. imports of foreign oil, excluding those from Canada, could fall 41 percent, or by more than 2.8 million barrels per day, BENTEK anticipates. “It would change the economic environment for the U.S.. on a global scale in a good way,” said Kari Cutting, vice president of the North Dakota Petroleum Council, an organization that promotes and enhances the discovery, development, production, transportation, refining, conservation and marketing of oil and gas in North Dakota, South Dakota and the Rocky Mountain region. By displacing foreign imports, the U.S. would add 0.15 percent to its gross domestic product each year, for a 1.5 growth in ten years. “That’s for free. That’s just balance of trade. It doesn’t include jobs and investment and those things,” Micsak said. Greater domestic oil production also should benefit business. For instance, it should help attract more manufacturing activity, like plastics and metals, Micsak said, because U.S. oil would be selling at discounts to global benchmarks. “We’ll have the cheapest feedstocks in the world outside of the Middle East,” he added. In 2011, the U.S. imported from foreign countries about 45 percent of the petroleum products it consumed, the lowest rate since 1995, EIA data show. 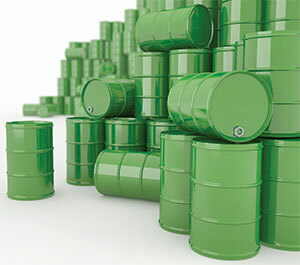 Petroleum encompasses crude oil and petroleum products like gasoline, diesel fuel, heating oil, jet fuel, chemical feedstocks, asphalt, biofuels (ethanol and biodiesel) and others. About 79 percent of petroleum imports were crude oil. The total imported, about 11.4 million barrels per day, came from about 80 countries. About 4.5 million barrels per day, or 40 percent, came from member countries of the Organization of the Petroleum Exporting Countries. About 1.9 million barrels per day, or 16 percent, came from Persian Gulf countries. The top five foreign petroleum sources, from most to least, were Canada (24 percent), Mexico (11 percent), Saudi Arabia (11 percent), Venezuela (8 percent) and Nigeria (7 percent.) These import figures from foreign countries are gross and, therefore, don’t take into account U.S. exports to these same countries. Of the U.S.’ 2011 total onshore and offshore oil production of 2.1 billion barrels, the highest numbers were from the Petroleum Administration Defense District 2 (Midwest) region, which includes both Dakotas, Illinois, Indiana, Kansas, Kentucky, Michigan, Missouri, Nebraska, Ohio, Oklahoma and Tennessee. About 298 million barrels came from PADD 2. Thirty-one states and two offshore regions produced oil last year, ranging from an annual total of 10 thousand barrels in Virginia to 530 million barrels in Texas. North Dakota produced 153 million barrels last year. Most of the oil extracted through 2022, BENTEK predicts, would come from the Bakken Formation, which spans parts of the North and South Dakotas, Montana and Saskatchewan, and the Eagle Ford Formation in Texas. Those two regions would add about 2.4 million barrels per day to the U.S. oil supply by 2022. Historically a small oil producer, North Dakota has moved into the second greatest oil-generating state, after Texas. As of the end of July, North Dakota was producing an estimated 674 thousand barrels per day, according to the state’s Department of Mineral Resources. BENTEK forecasts production from the North Dakota portion of the Williston Basin, which encompasses the Bakken and Three Forks Formations, to gradually increase through 2022 to a high that year of 1.8 million barrels per day. All of the oil produced in North Dakota stays in the U.S., said Justin Kringstead, director of the North Dakota Pipeline Authority, which aims to diversify and expand the North Dakota economy by facilitating development of pipeline facilities to support the production, transportation and utilization of North Dakota energy-related commodities. A small percentage of North Dakota-extracted oil stays in-state, and the rest gets shipped to various domestic locations—all for refining. It’s possible, however, some will be moved to refineries in Eastern Canada now that rail access to multiple markets is available. Eventual, true oil independence for the U.S. isn’t likely, as the country most probably will continue relying on Canada for some product. BENTEK estimates oil imports from Canada will rise to 900 thousand barrels per day by 2016.